We all know, or we think we do, what happens when central banks print money. There are any number of historical images from which we can refresh our collective memory. Weimar Germany usually comes to mind, as does Venezuela or Zimbabwe in recent times. But what about the opposite? It sounds absurd. No government officials in their right mind would ever stop the printing presses. If that situation ever happened to arise there must be something seriously wrong, right? I really don’t think people appreciate just what the eurodollar system means in detail. 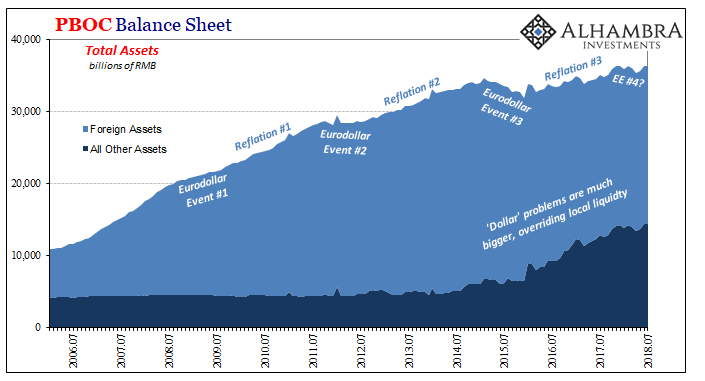 Even these eurodollar events we keep having don’t really do justice to describing the various ways they really hurt. Robert Triffin was correct in one sense when he described his famous paradox six decades ago. The dollar carries huge responsibilities that are often unsuitable to competing forces which arise more often than we might expect. It didn’t seem that way for a long time, though. The prior so-called Great “Moderation” wasn’t blind dumb luck so much as Economists James Stock and Mark Watson were at loss to find the monetary center of gravity really behind it (or Bernanke, he of “global savings glut” lunacy). Before August 2007, there was no downside to letting the Trojan Horse of contagion through your national gate. Domestic monetary systems that were therefore built upon eurodollar supply can only suffer by the lack of it. This is contrary to the narrative that every central bank is, well, central. They aren’t, though they often do everything in their power to appear that way. Some central bankers actually still believe it, and you can tell which ones by how quickly they fail. There might remain some ambiguity in your mind when we review each month the PBOC’s fortunes and foibles. After all, bank reserves and deposits are as often financial considerations and therefore potentially subject to internal factors unrelated to the dollar. It’s less the case when speaking specifically about the PBOC’s asset side. Here, there can be no doubt because it is literally made up of forex, largely denominated in dollars. The Chinese monetary pyramid (it’s not really a pyramid, but for illustrative purposes why not?) begins in foreign money. That’s not arguable. Neither is its history over the last decade. Since 2008, the asset side has grown more slowly than it had when the eurodollar system was in full growth. 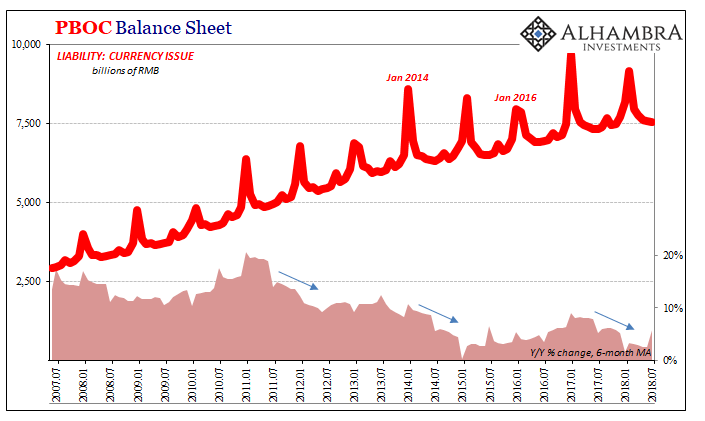 The rhythms of volatility have become more extreme over time, especially 2014’s “rising dollar” – or what I’ve taken to calling Eurodollar Event #3 so as to specify exactly which “rising dollar” period. Central bank accounting can be tricky and confusing but not on these high levels. If the asset side stops growing, then the liability side does, too. It is this other side where money resides. Thus, if assets can’t increase the money supply can’t, either. The immediate consequences of these periods are most often felt within China’s vast banking system. 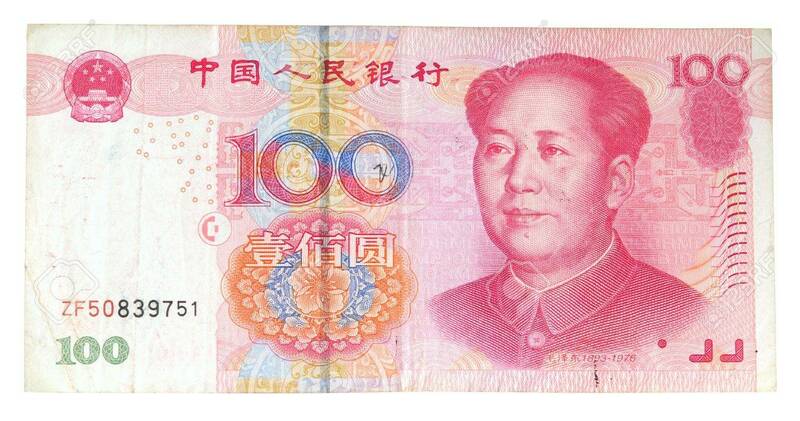 We often talk about Chinese money exclusively in terms of “dollar” or RMB liquidity out of habit. And there are any number of reasons why. 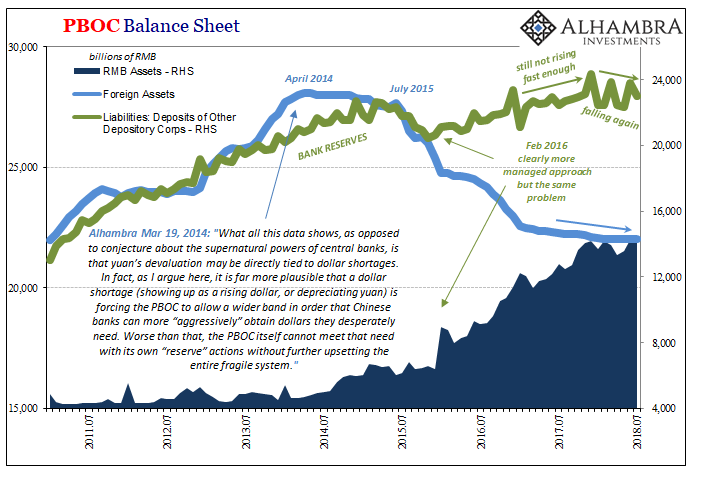 Changes to the level of bank reserves, which are one of the two money liabilities belonging to the PBOC, have clear consequences in the things we Westerners seem to care about. The full extent of these dollar difficulties, however, go way beyond the periodic problems for Shanghai stock slingers. There are on-the-ground repurcussions that parallel the issue for bank reserves. 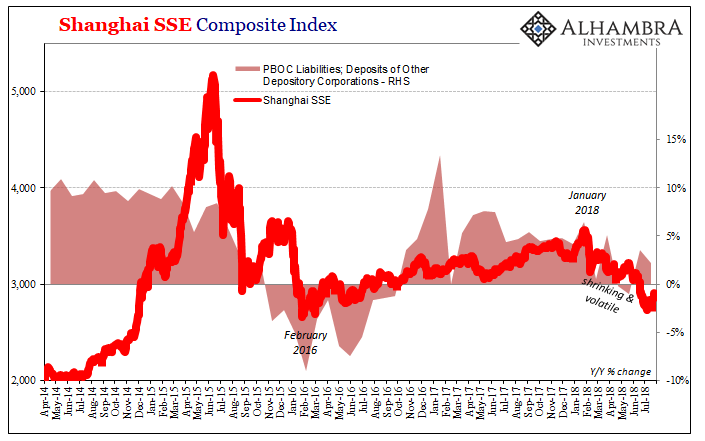 If the PBOC has problems on its asset side, and it does, then that restricts its entire ability to increase money in any of the line items on its liability side. Again, we have to ask, how big of a problem do you have if you have to stop the actual, literal printing presses? This is not an asset bubble problem. I understand those who want to make the case that the PBOC is intentionally restricting bank reserves so as to get some measure of control over wealth management products and whatnot wholesale finance in China. In that narrow focus, bank reserves still only play a marginal role. But this is a much bigger issue than all that. You don’t slow physical currency down to nothing if you have any other option. You just don’t. No matter what craziness is going on within the financial system and various money markets at times, the last thing you would ever want is to deprive the domestic economy of the physical currency upon which it still heavily depends. Actual currency has everything to do with economy and almost nothing to do with wholesale money. Interbank markets operate purposefully without physical PBOC notes. The evolution of the eurodollar and all its various local descendants was along the lines of an environment devoid of these physical realities (efficiency). Tangible currency is a real economy tool alone. Economy follows money, though in an ideal situation that wouldn’t be the case. In other words, monetary conditions are supposed to be in the background but are forced into this kind of a leading role whenever the monetary system is unstable; especially chronically unstable. Either too much or too little, in a state of dysfunction economy follows money. You don’t stop the printing presses unless there is something majorly wrong. 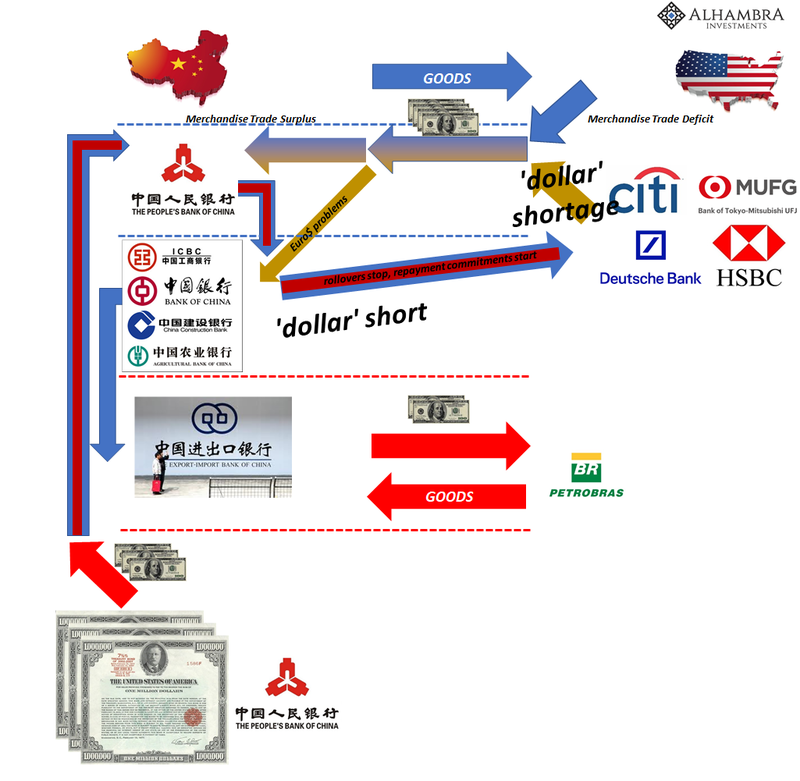 We have the benefit of knowing what that is: the original Chinese shortcut of using eurodollars as their monetary base.  It gives us the added advantage of realizing that when big Chinese money problems arise we know right where they are coming from.